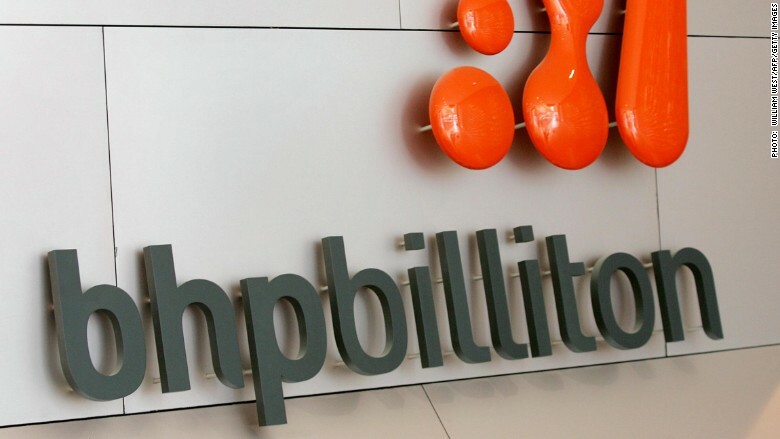 One of the world's biggest miners is taking a huge hit in the U.S.
BHP Billiton announced a "disappointing" $7.2 billion pre-tax writedown on its U.S. oil and gas assets, following a slump in prices. The Anglo-Australian mining company said it was reducing the number of rigs in its onshore U.S. business to five, from seven currently. Just a year ago it was operating 26 rigs in the U.S.
"Oil and gas markets have been significantly weaker than the industry expected," CEO Andrew Mackenzie said in a statement. "We responded quickly by dramatically cutting our operating and capital costs." BHP Billiton (BHP) shares were down 5.8% in London on Friday morning. Related: Is it time to bail out the U.S. oil industry? The company also said it will review its investment and development plans for the rest of the 2016 financial year. In addition to collapsing commodity prices, BHP is also facing pressure over a dam accident in Brazil, which killed at least 16 people and caused one of the country's worst environmental disasters in history. "In isolation (the writedown) would be bad enough but when coupled with the disaster in Brazil, the company's finances are being seriously tested," Alastair McCaig, market analyst at IG, wrote in a note. BHP invested $20 billion in U.S. oil and gas in 2011 and 2012, just as the shale boom started. But the value of these assets collapsed along with the oil prices. Oil has slumped from well over $100 per barrel to below $30 in just 18 months. Companies like BHP are suffering big time. Across the industry, the crash has delayed projects worth nearly $400 billion and sparked a wave of bankruptcies. As many as 130,000 jobs in the U.S. energy industry disappeared in 2015.